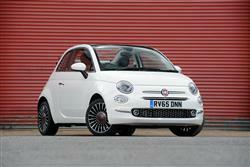 Find out everything you need to know on the new Fiat 500 from independent vehicle review website Car And Driving. You can watch the video review to the left to see more of the car or read their written review below to get a true insight from an expert in the automotive industry. Fiat's lovable 500 city car is harder to resist in improved 500C cabriolet form. Jonathan Crouch reports on the updated version. The open-topped Fiat 500C has done well for Fiat, but time rolls on and this car now faces tougher competition from some more affordable rivals. Hence the need for the package of revisions we're going to look at here which has brought the Italian brand's convertible bambino bang up to date. How much cute can you cram into one car? Well, even the Tichy manufacturing plant in Poland where Fiat builds this convertible version of its 500 city car has a cute name. It's tempting to imagine the facility as a Willy Wonka style operation where the cars float on rivers of golden syrup down assembly lines run by a green-skinned chorus line of the vertically challenged. A factory of fun where the foreman is a talking spoon and there's a gingerbread man in middle management. This probably isn't the case, although Fiat has reported an upsurge in requests for factory visits since launching the 500C. The version we're going to look at here has been improved in recent times. First in 2014, when a pokier 105bhp version of the clever two cylinder TwinAir petrol engine was added to the range. And more recently with a package of styling and equipment updates that include the widescpread roll-out of the brand's clever 'Uconnect' infotainment technology across the line-up. Let's check it out. As ever, this car remains cute made metal. Neither the engine range or the driving experience have really changed with this updated model. Drive dynamics though, are a virtual irrelevance to lots of Fiat 500C buyers. They'll have already fallen in love with the car in a brochure, on a TV ad or upon seeing one in the street. Nevertheless, the car promises to be fairly adept on the road with the same basic set-up as the hard-topped 500, a chassis that's also shared with the Fiat Panda and Ford Ka. The petrol-only engine range opens with a 69bhp 1.2-litre petrol but those seeking a little more thrust will step up to the 85bhp TwinAir or the pokier version of this unit which has 105bhp. The 1.4-litre turbocharged petrol Abarth sporting models also continue. A choice of transmissions is available, with the 500C getting a five-speed manual gearbox as standard while presenting customers with the option of upgrading to the Dualogic robotised gearbox. Fiat's fuel saving Start&Stop technology is also included. Fiat has kept exterior styling tweaks to the minimum with this improved model. Up front, there's a sleeker chrome grille that sits below revised headlights and is positioned at more of an angle than before. Between these two elements are smarter daytime running lights, with a shape that echoes the zeros of the '500' logo. Rounding the front off are updated chrome trims and a ribbed bonnet that that looks a little more stylish. At the rear, there are smarter tail lights that incorporate a body-coloured panel in the centre. This has meant the reversing and fog lights have moved from the clusters to the lower rear bumper. Your Fiat dealer will also offer you a more fashionable choice of wheels, graphic packages and paint colours to round off the updates. As before, this convertible model pays homage to the original 500 cabriolet of 1957. It's better to think of the roof arrangement as a huge canvas sunroof rather than a full folding canopy. At the touch of a button, the entire centre section of the roof retracts into a concertinaed bundle just above the boot. It's not the most elegant piece of engineering but the sight of car with its roof retracted adds to the retro appeal and with the roof-up, it's tough to tell a convertible 500 from a hard-top one. The roof itself features a glass rear window and is available in a choice of colours, so buyers can personalise their car. The simple roof arrangement also means that there's a decent amount of room in the rear seats of the 500C. There are some convertible cars twice the size of the little Fiat that are stingier with the legroom they lay on for passengers in the back. Delicious design details drip from the 500's interior. It's like a tiny pearl, especially when the ivory finish is specified. There's a very well-judged blend of retro chic and ruthlessly modern contemporary design inside, with circular head restraints and neat 500C badging on the Panda-sourced dashboard. Chrome-ringed vents and a fascia that can be specified in the same colour as the body are other highlights. As part of the updates, buyers now get a clever 7-inch TFT 'Uconnect' information screen in the centre of the dash. Prices start from around £13,500 - and if you think that's high for a citycar, even an open-topped one, you'll need to know that there's still quite a hefty £2,500 premium to pay for the 500C derivative over an equivalent model in the 500 hatch range. That looks a little steep when for the same kind of folding roof arrangement, a Peugeot 108 or a Citroen C1 will charge you just £1,000 extra. Still, this Fiat has a character that those rivals lack and its specification looks quite generous. Trim levels range from 'Pop', through 'Pop Star' to 'Lounge'. Key options include the Dualogic semi-auto gearbox which requires a premium of around £750. So what do you get for your money? Base 'Pop' trim has LED daytime running lights and a Uconnect infotainment system with six speakers, plus AUX-in/USB ports and steering wheel remote controls. Plusher 'Pop Star' spec adds air conditioning, 15-inch alloy wheels and heated mirrors with body-colour caps. Top 'Lounge' spec meanwhile, gets you a panoramic glass sunroof, rear parking sensors, a chrome front grille, front fog lights, a leather-trimmed steering wheel and a Uconnect 5" LIVE touchscreen infotainment system with smartphone integration. If you want to go further, then your dealer will want to tell you about the latest range of so-called 'Second Skin' decal packages. There's no efficiency penalty in opting for this convertible bodystyle. Predictably, the petrol engines powering the diminutive 500C turn in strong fuel economy and emissions figures. The 1.2-litre petrol unit manages 60.1mpg on the combined cycle with 110g/km of CO2, but you'll do much better if you're able to stretch to the higher-tech two cylinder TwinAir 85bhp model, which manages 74.3mpg and 90g/km. The pokier 105bhp version delivers 67.3mpg and 99g/km of CO2. Our experience suggests that you might struggle to get close to hese figures in everyday motoring unless you continually press the dash-mounted 'eco' button - which restricts engine torque. What else? Well, this car should certainly be cheap to insure and the warranty is a typical three year affair but with a 100,000 mile limit that's significantly higher than some other brands will give you. 500C models hold their value very well and that's unlikely to change any time soon. Don't be tempted to go customisation-crazy with the options list though: not everyone will share your taste or want to pay extra for garish graphics when it comes time to sell. The 500C can't offer the most affordable route to open-topped motoring in your citycar, but it's still a package than many buyers in ths segment will find hard to resist. The latest changes haven't really changed this car's essential appeal, but the extra customisable options will be welcome and the styling updates give the car a slightly fresher look, inside and out. Here's a carefree car that's free, sunny and open in its outlook - and very difficult to dislike, with a sheer joie de vivre that's central to its charming appeal, turning even the most mundane of commutes into something far more attractive: a journey to be savoured, rather than endured.